Nina Ahmad speaks with members of the media in Philadelphia, Wednesday, Jan. 31, 2018. 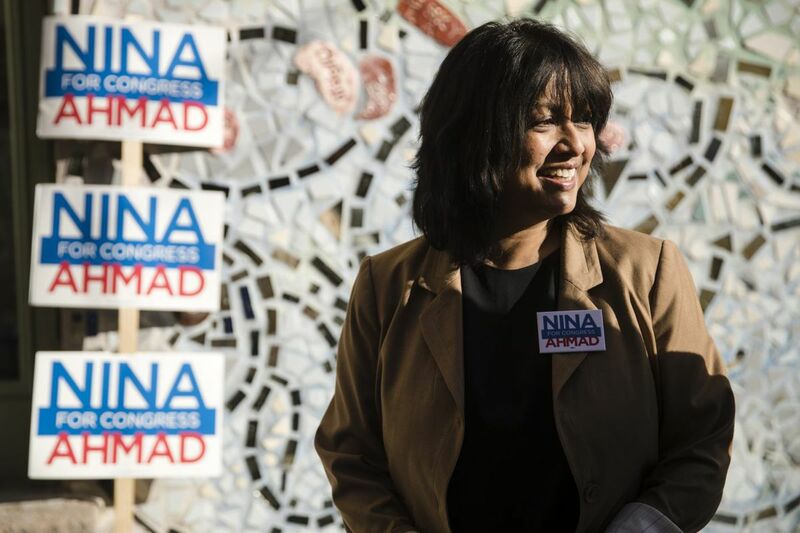 Nina Ahmad, a former aide to Mayor Kenney who had been campaigning for a Philadelphia congressional seat, is now jumping into the race for lieutenant governor. The move comes a week after the Pennsylvania Supreme Court imposed a new congressional map, changing district lines and scrambling U.S. House races across the state. The court had ruled that the previous map was an unconstitutional partisan gerrymander drawn to favor Republicans. "Harrisburg has been male-dominated for too long, and its culture won't change without new voices," Ahmad said in a statement Monday. "I will partner with Governor Wolf to help stamp out sexism and sexual harassment that holds us back." She said she would push for a tax on natural gas drillers to pay for schools, something Gov. Wolf has advocated but which the GOP-led legislature has blocked. Ahmad announced in November that she would quit her job as deputy mayor for public engagement to challenge longtime U.S. Rep. Bob Brady (D., Pa.) in the First Congressional District's Democratic primary. Brady said last month he would not seek reelection. The new map left Philadelphia with one fewer congressional seat by effectively displacing Brady's district. Another former First District candidate, pastor Kevin Johnson, said Monday he will run against U.S. Rep. Dwight Evans in the newly configured Third District, which now will be in Philadelphia. Willie Singletary, a former Traffic Court judge who was convicted of lying to the FBI and who had been challenging Brady, has also said he will run against Evans. Ahmad loaned her campaign $450,000 and had about $560,000 on hand as of Dec. 31, according to records filed with the Federal Election Commission. Ahmad, former president of the Philadelphia chapter of the National Organization for Women, has told friends that she has spoken with EMILY's List regarding her prospective candidacy for lieutenant governor, according to a person familiar with the matter. The group works to elect Democratic women who support abortion rights. About a half-dozen other candidates are seeking the Democratic nomination for lieutenant governor, including the incumbent, Mike Stack III of Philadelphia. Gov. Wolf, a Democrat, hasn't endorsed a candidate in the May primary. The governor yanked Stack's security detail last year amid allegations that the lieutenant governor and his wife had mistreated staff. Stack "has failed to provide the leadership we need," Ahmad said. "I will bring fresh new energy to serve all of our families better." Marty Marks, a spokesman for Stack's campaign, called Ahmad "another ambitious newcomer who has zero experience in state government and no statewide accomplishments." Stack, he said, is an "accomplished leader" who has implemented "nationally recognized reforms at the Board of Pardons." In another sign of the Supreme Court's impact on the political landscape, State Rep. Madeleine Dean decided last week to drop out of the lieutenant governor's race to run in the newly configured Fourth Congressional District in Montgomery County, where she lives. –Staff writer Holly Otterbein contributed to this article.